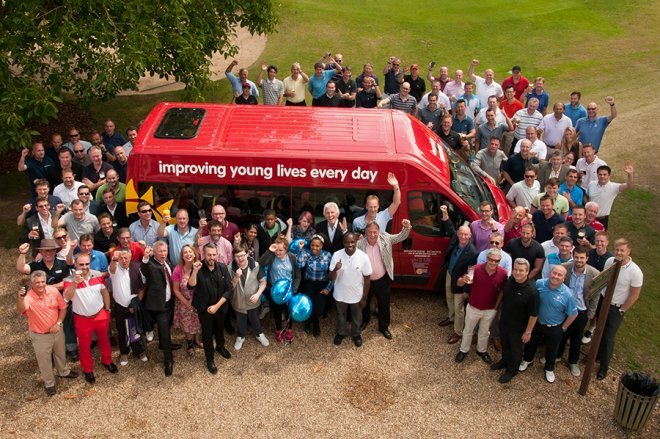 The 17th ACI UK Annual Charity Golf Day took place on July 15 2015. We are delighted and proud to say that it was a spectacular success in respect of the golf competition itself and other fundraising activities on the day. As always, the highlight of the day and the raison d’etre for this prestigious annual event was the presentation of our 53rd Variety Sunshine Coach to the Brookside School in Ilford. We are immensely grateful for the very generous support of CME Group, our Diamond Sponsor, and in particular to David Emerick and Dianne Readings at CME, who worked hard behind the scenes to support our event. Players, supporters, ACI Committee Members and Variety ambassadors join the staff and students of Brookside School in Ilford for the presentation of their new Sunshine Coach. The venue, Buckinghamshire Golf Club, hosted the Ladies European Masters the week previously and the course was in beautiful condition. Despite somewhat drizzly weather – helpful in slowing down the greens which were recently voted among the best in the country – players’ spirits were not dampened and all teed off promptly at the 8.30 Shotgun start following a hearty breakfast, courtesy of Markit. (The grounds staff worked wonders getting everyone to their allocated starting tee). Everyone took advantage of buggies smartly sponsored by Flextrade and back by popular demand, R5FX’s roving refreshment buggies dispensed cold drinks and snacks to competitors. Many thanks to the R5FX team for their excellent hospitality and on-course advice (dispensed freely to all who would listen!). Thanks also to Caplin, wifi sponsors on the day, who ensured that we were all able to keep in contact with the ‘real world’. ADS Securities London also sponsored the event, serving drinks on the 9th tee before players attempted to get nearest (enough) to the pin to win a gold bar. Sadly, nobody got quite close enough but the nearest received a bottle of Champagne and the gold bar was raffled later in the day. The first and second placed teams were incredibly close, with EC1 Partners and EBS both on 95 points, with ECI pipping EBS to the post on countback. Thomson Reuters took third place with 92 points. There were plenty of other opportunities to win spot prizes on the course with hole-in-one prizes sponsored by Curex, longest drive by Equinix, straightest drive by ParFX and several nearest the pin holes sponsored by BATS Hotspot, EC1 Partners and R5FX. Congratulations to all our winners! As the temperature started to climb, everyone was pleased to get back to the Clubhouse for lunch. EBS supported us with pre-lunch drinks and everyone enjoyed a well-earned rest while we presented the new Sunshine Coach to Brookside School, with the help of the Variety team ambassador and former member of The Shadows, Bruce Welch. (The coach was 100% funded from the proceeds of the event). The presentation of the Coach is always the high point of the day and the head teacher of Brookside School thanked ACI UK with a heartfelt and hugely touching speech about the enormous difference it would make to the school and its students. There were not many dry eyes in the house at this point. Following lunch we held more fundraising activities before the prize-giving ceremony. Our auctioneer from Variety, Dave Selves, left no stone unturned in his quest to extract more money from the assembled audience and the auction raised over £4000, all of which will be directed towards Variety. In addition to the auction, a £20 raffle raised a further £2000. Our sincere thanks to all who kindly donated raffle items or supported the event through filling the golfers’ goody bags. Total funds raised for and on the day once again exceeded our expectations. We all know that the foreign exchange market is having a tough time at the moment and to be able to continue to support Variety in this way is a huge achievement by all involved. We are very aware that our sponsors, supporters and team captains have to work increasingly hard to persuade their respective marketing departments to make room for this event in ever-tightening annual budgets and we are enormously grateful for their continuing commitment and support. We hope that we will be able to achieve similarly marvellous results next year and look forward to seeing you in the markets (or an a golf course!) soon. With sincerest thanks to all players, sponsors, prize donors and event supporters. To find out more about participating in the Annual Charity Golf Day, contact Al Crane or Tina Kane.